I am sharing another crock pot recipe with all of you. When I have many chores to accomplish, the crock pot is my friend. We are also trying to lighten things up a bit. 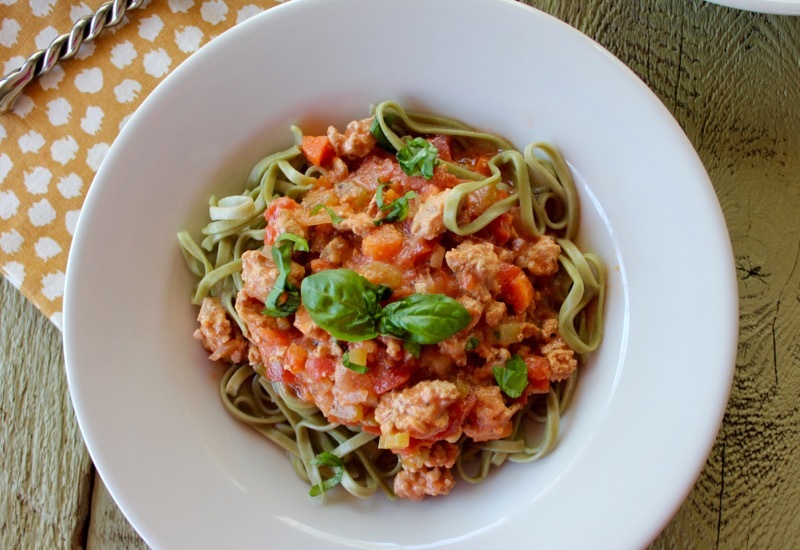 By using ground turkey and lots of vegetables this Italian sauce is light and goes well with a spinach linguine that is also lower in calories than regular pasta. 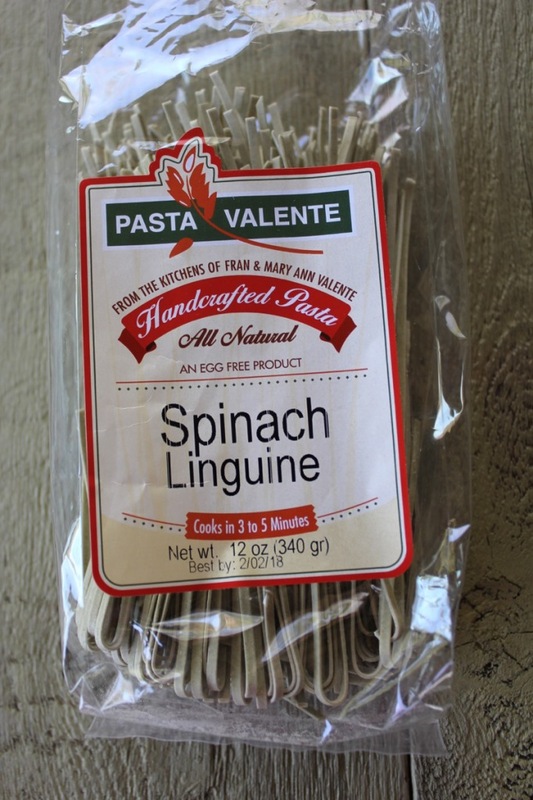 Pasta Valente is made in Charlottesville, Virginia by a Mother and Daughter team. It is handcrafted, vegan and flavorful. Plus it cooks in minutes. I found it at my local supermarket. The Turkey Ragu Bolognese comes from one of my favorite slow cooker cookbooks, The Italian Slow Cooker by Michele Scicolone. 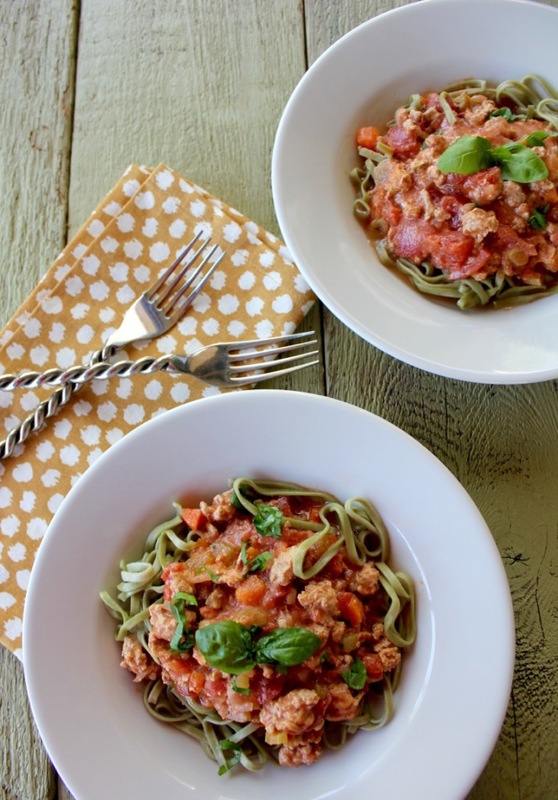 Another recipe that I shared with everyone last year was her Spicy Tuscan Sausage Ragu. I make it often. We traveled to Washington DC last week to attend the funeral and burial of General Earl E. Anderson in Arlington National Cemetery. He was a part of our extended family. His list of accomplishments in life is beyond belief, but his demeanor was always humble and kind. 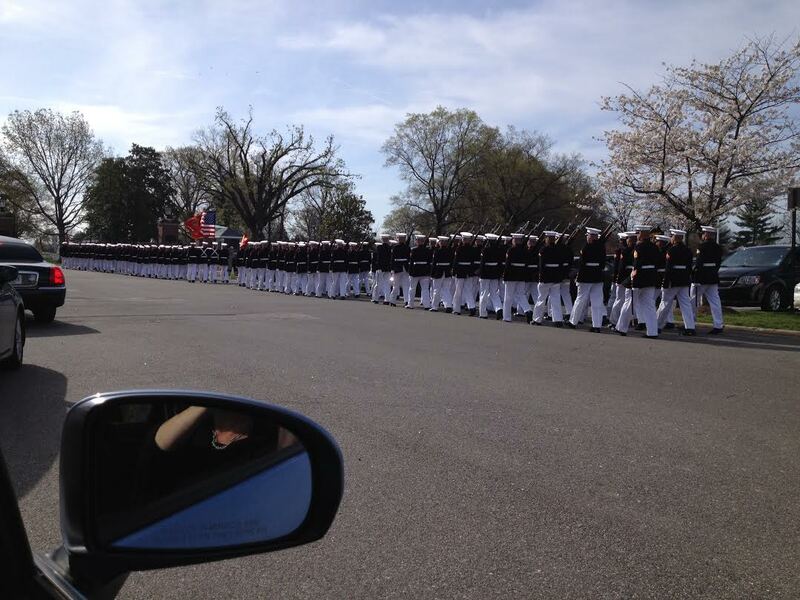 It was a full marine battalion procession to the grave site with a 21 gun salute and a fly over. The tribute to this amazing man was truly awe inspiring. We are back at the cottage this week, cleaning, sweeping and freshening both the interior and the exterior of the house. 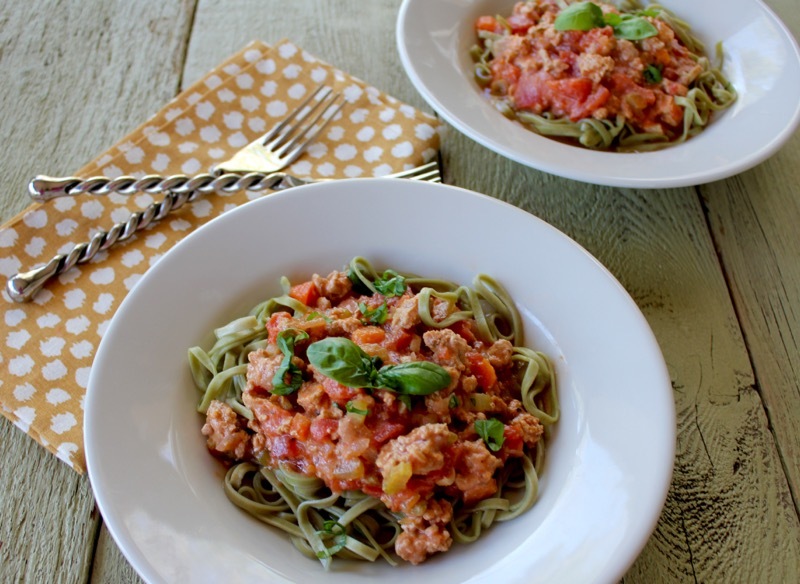 This Turkey Ragu Bolognese is the perfect slow cooker dinner to have on hand while spring cleaning. In a large saucepan, melt the butter with the oil over medium heat. Add the onion, celery, carrots, and garlic and cook until tender and golden, about 20 minutes. Stir in ground turkey and cook, stirring often, until browned, about 15 minutes. Stir in the tomato paste, wine, and broth and bring to a simmer. Scrape the mixture into the slow cooker and add the tomatoes, nutmeg, and salt and pepper to taste. Cover and cook on low for 6 hours, or until thick. Stir in the cream and cook for 15 more minutes. Note: I saved the liquid from the can of tomatoes and added it to the crock pot also. Posted on April 4, 2016 at 9:07 am. Here is another great idea for Thanksgiving. Salads are not usually a big part of the holiday feast, but why not? With the heavy stuffing, mashed potatoes, sweet potato casserole and green beans slathered in cream of mushroom soup and french onion rings, something a little lighter should be a welcomed addition. 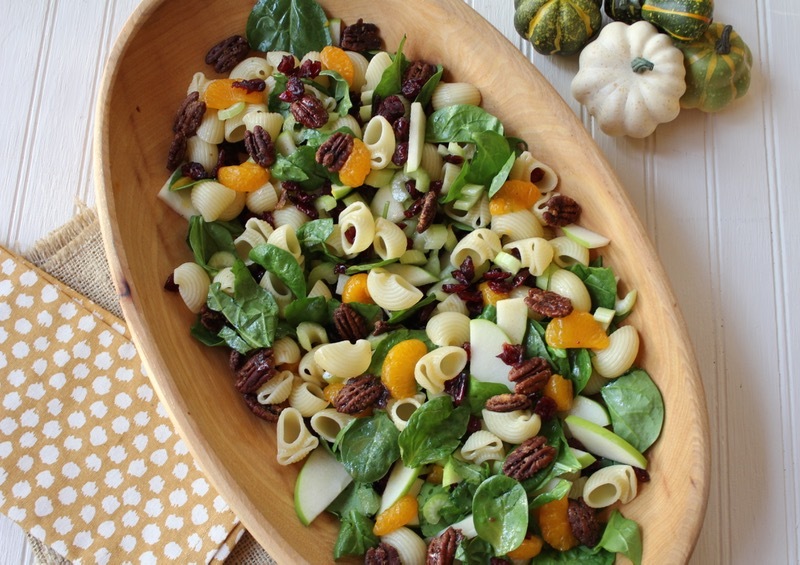 The components of this salad are all about Fall; apples, oranges, pecans, baby spinach and dried cranberries. The pasta is just a small addition that gives the salad body. I even amped the flavor up by making my sweet Bourbon pecans. 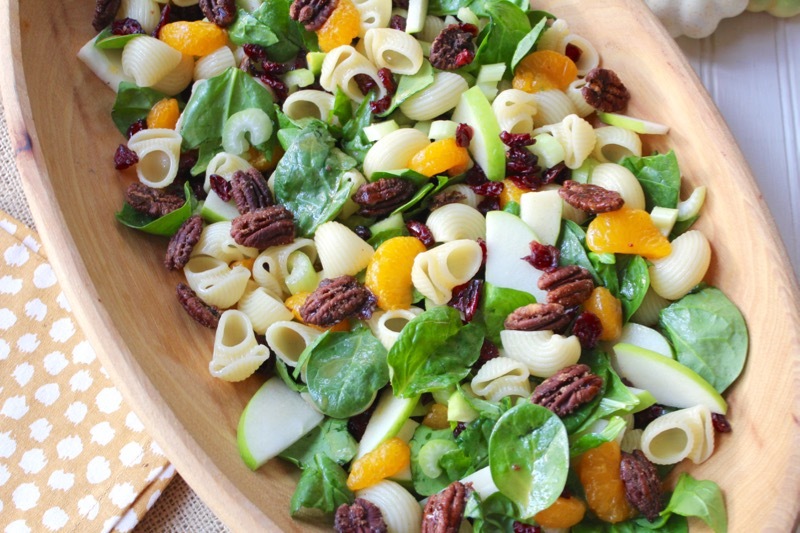 This is a refreshing salad for the holidays. The citrus dressing is light and delightful. I saw this recipe on Facebook. It was posted by my DIL’s Mom, Darla. Since we will all be together for Thanksgiving I think this would be a great dish for our shared table. Thanksgiving will be at Michael (Our Son) and Kristen’s (Our DIL) home. They just moved into a new and bigger home that will accommodate all of the family. We are looking forward to it. The original recipe, and a much better picture can be found here. A few more pictures of Italy. 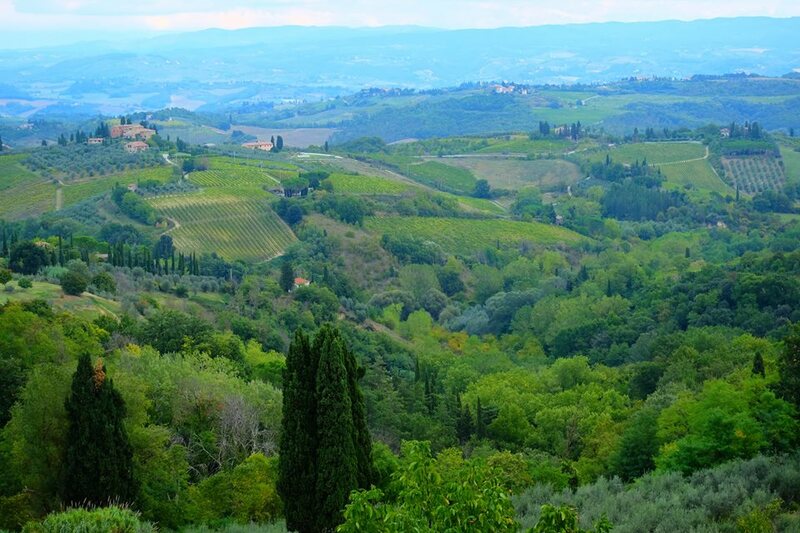 We spent four days in Tuscany with a much too short trip into Florence. 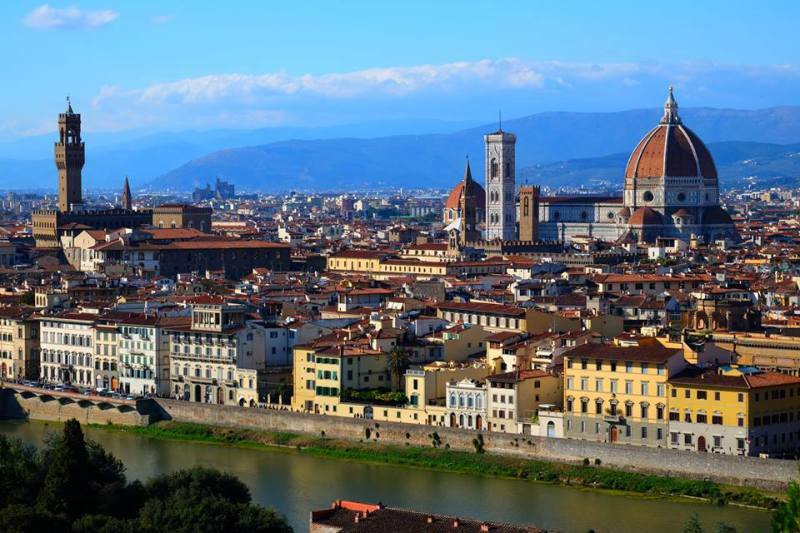 But there is so much to do in the region that we were happy with our short trip into this historic city on the Arno River. 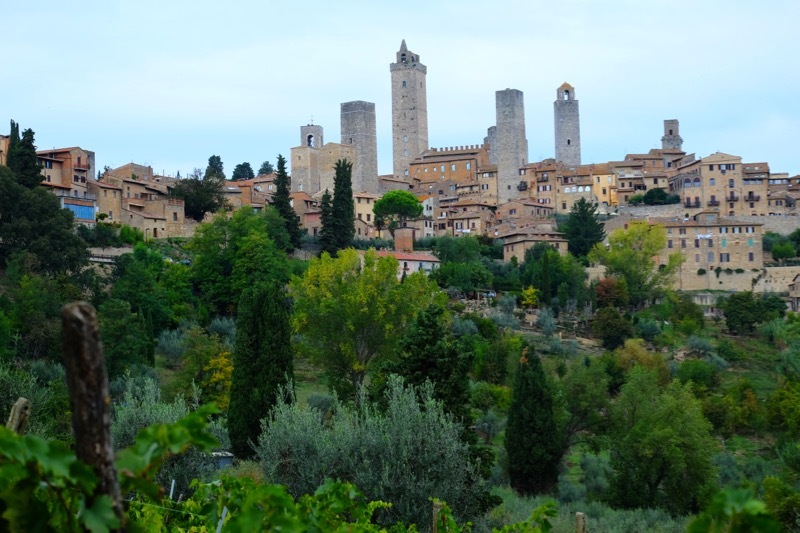 We stopped in San Gimignano, the epitome of a Tuscan hill town. It still has 14 medieval towers standing out of the original 72. Family towers were important in the 13th century. The feuding noble families ran the hill towns and expressed their power by how tall their towers were. Not much has changed over the years has it? Although we enjoyed visiting the town, it was a tourist trap. 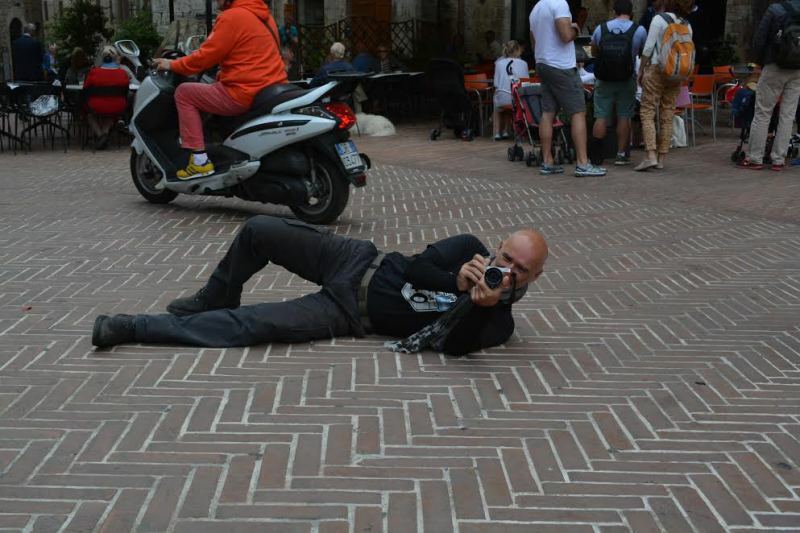 Our intrepid tour guide groveled to a new low to please us with a good picture. (although the picture is a little crooked). Notice all of the people eating Gelato around us! But Laurent got his shot of us. It was just one of many of his professional studies. We were lucky to have this dear friend as our guide through Italy. Thank you Laurent and Carole for starting your touring company and allowing us to be your test guests. You are the best. 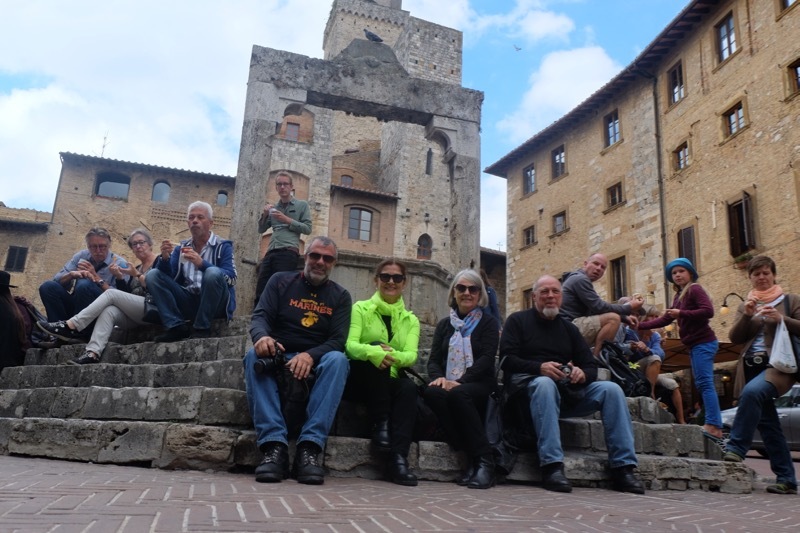 If you are interested in traveling in France or Italy by motorcycle or scotters, they will treat you so well. Here is the link. Ride in Tours is the real thing. While the pasta is cooking, prepare the dressing. In a food processor or blender combine the oil (the vegetable oil yields a richer and in my opinion better taste, but the olive oil is healthier and still tastes great), apple cider vinegar, white wine vinegar, sugar, (adjust — more or less to personal preference, we like a less sweet dressing and use about 2 tablespoons) paprika, and onion powder. Pulse or blend for about 10 seconds. Stir in the poppy seeds. Posted on November 9, 2015 at 8:33 pm. 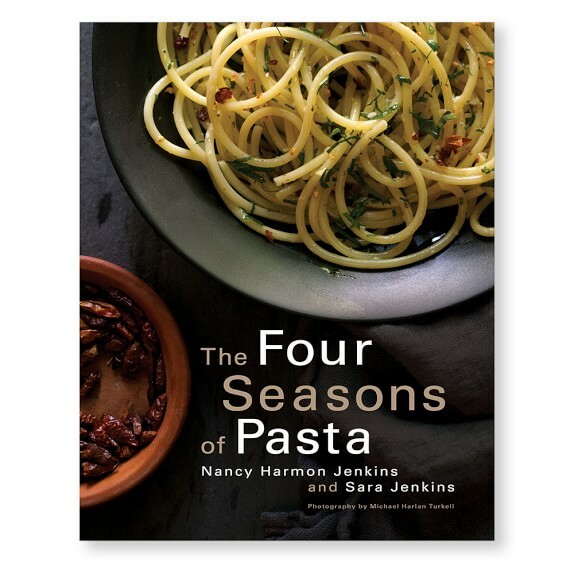 Before we left for Italy I was sent an advance proof from the publisher of a new cookbook called The Four Seasons of Pasta by Nancy Harmon Jenkins and Sara Jenkins. It was released this week. Acclaimed food writer Nancy Jenkins (The New Mediterranean Diet Cookbook ) teams up with her Master Chef daughter Sara, owner of two NY City restaurants (Porsena and Porchetta), to publish this unique book on pasta. It focuses on fresh ingredients from the four seasons. Dressing pasta with fresh ingredients results in dishes that celebrate this humble and readily available product. 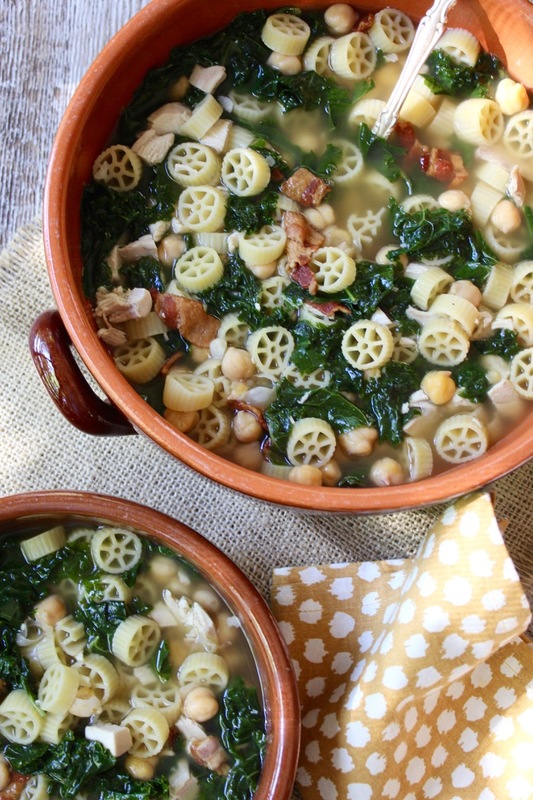 When Nancy Jenkins first moved to Tuscany in the early 1970’s, she quickly embraced pasta. Over the years, she and her daughter, while cooking in their Tuscan farmhouse, have been inspired by this “queen of the table” as described by true Italians. Because it is Autumn, I decided to concentrate on that section of the cookbook. It includes combinations like Pumpkin and Pumpkin Seed Maccheroncini, Pasta with Crumbled Sausage, Sage, and Winter Squash and Chestnut Ravioli with Brown Butter, Sage, and Fennel. 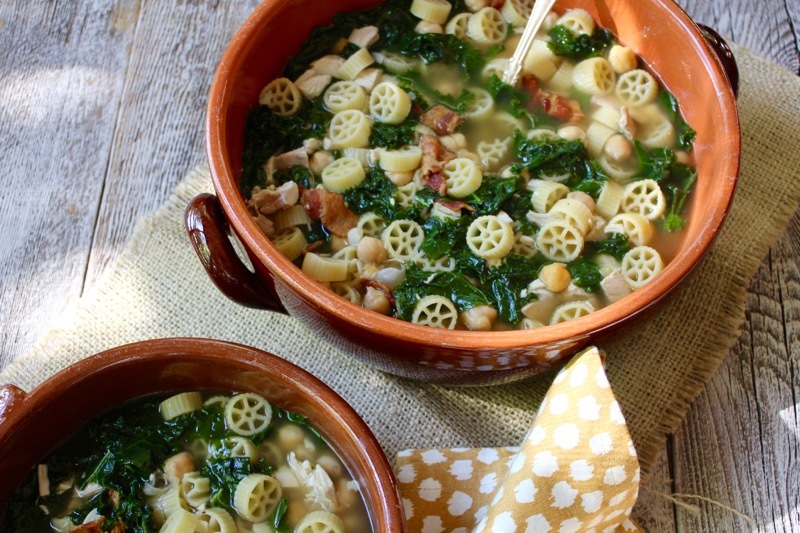 I chose to make their Zuppa di Pasta e Ceci (Rich Chicken Soup with Pasta and Chickpeas). It also includes Tuscan kale, which is a great Fall green. For this Autumn recipe, it would be wise to make a rich, flavorful chicken stock. But if you are short on time, a boxed chicken stock will also work. The authors recommend dried chickpeas, but frankly, I used a can of chickpeas because time is limited right now. And I am still suffering from jet lag. They also recommend adding diced chicken to the soup. I roasted a chicken when we returned home yesterday because I was anxious to be cooking in my own kitchen again. So the rest of that chicken went into the soup. We will be enjoying this soup tonight. The weather has cooled. We are glad to be home. But Italy is an amazing country with inspiring cuisine. There will be more posts about Italy soon. I highly recommend this well researched cookbook from two Italian authorities on all that Italy has to offer. It was a treat to come home and make this easy authentic dish. Bring the chicken stock slowly to a simmer over medium-low heat. While the stock is heating, prepare the greens, stripping away the tough center stalks where necessary and slivering the leaves. You will have 7 to 8 cups trimmed and slivered greens. Combine the oil and pancetta in a medium saucepan set over medium-low heat. Cook until the pancetta fat starts to run and the the little cubes begin to brown and crisp. Add the garlic and continue cooking, raising the heat slightly, until the garlic has browned on all sides. Remove the garlic and set aside. Add the greens to the pan with the water clinging to their leaves. (You may not be able to get all the greens in at once; let the early ones cook down a bit, then add another handful, and keep doing that until all the greens are in the pan.) You may wish to add about 1/2 inch of boiling water to the pan to keep the greens from scorching. Cook the greens until they are thoroughly limp, adding salt and pepper to taste. By now the stock should be simmering. Add the greens and pancetta to the stock. You may add a tablespoon or so of liquid left in the bottom of the greens pan, but don’t add a lot more because it may darken the clear, rich color of the stock. If your wish, chop the reserved garlic clove and add it to the stock. Stir in the chickpeas and pasta, along with as much or as little or the dried red chili as you wish. (Add the diced cooked chicken, if available, at this point.) Let simmer until the pasta is done, 8 to 10 minutes. Serve immediately, while the soup is hot. Pass the grated parmigiano at the table. Reprinted by arrangement with Avery Books, a member of Penguin Group (USA) LLC, A Penguin Random House Company. Copyright © Nancy Harmon Jenkins and Sara Jenkins, 2015. Posted on October 7, 2015 at 6:28 pm. We returned to Florida from North Carolina just before winter storm Octavia descended upon the state. Because the Southern states were being hit so hard with snow, ice and sleet, there was a danger that power outages would occur. It was a comfort to see over 30 power company trucks with buckets traveling in convoy from Florida up I 95 to the affected states. I’m sure there were more Florida utility trucks traveling north up I 75 as well. We are definitely the United States of America. It was also a comfort to me to watch the outside temperature gauge in our car rise from 16 degrees in NC to 75 degrees in Florida. This bowl of pasta and shrimp was also a comfort to me the day after we got home. I was in the mood for something citrusy and healthy but with a little heft to it. After all, I was still trying to thaw out. The dish is elegant and easy. 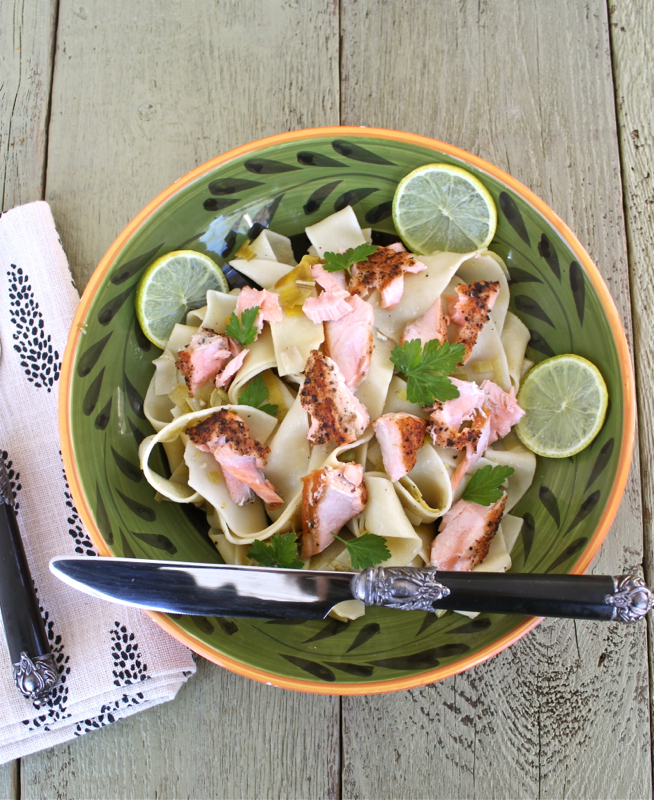 Rosy salmon, pale green leaks and fresh herbs are tossed with broad pappardelle pasta. I adapted the recipe from Cooking Light Magazine. I didn’t have all of the fresh herbs that they called for, but used what I had; which was parsley, basil and thyme. It is nice to be able to keep small pots of herbs just outside my door. The lemons came from our small tree. This had the taste of spring to me. For all of you who are suffering through this brutal winter, I wish you an early spring. In the meantime, this recipe might help a little. Enjoy. 1. Cook pasta according to package directions, omitting salt and fat. Drain pasta in a colander over a bowl, reserving 1/4 cup cooking liquid; keep pasta and cooking liquid warm. 2. Heat 2 tablespoons olive oil in a large saucepan over medium heat. Add leeks, savory, and 1/2 teaspoon salt; cook 15 minutes or until leeks are translucent, stirring occasionally. Increase heat to medium-high. Add wine; cook 1 minute. Add stock; bring to a simmer. Remove from heat; stir in pasta, reserved cooking liquid, parsley, and lemon rind. 3. Sprinkle salmon fillet with remaining 1/4 teaspoon salt and pepper. Heat a large skillet over medium-high heat. Add remaining 1 tablespoon olive oil and butter; swirl until butter melts. Add salmon fillet, and cook for 5 minutes on each side or until desired degree of doneness. 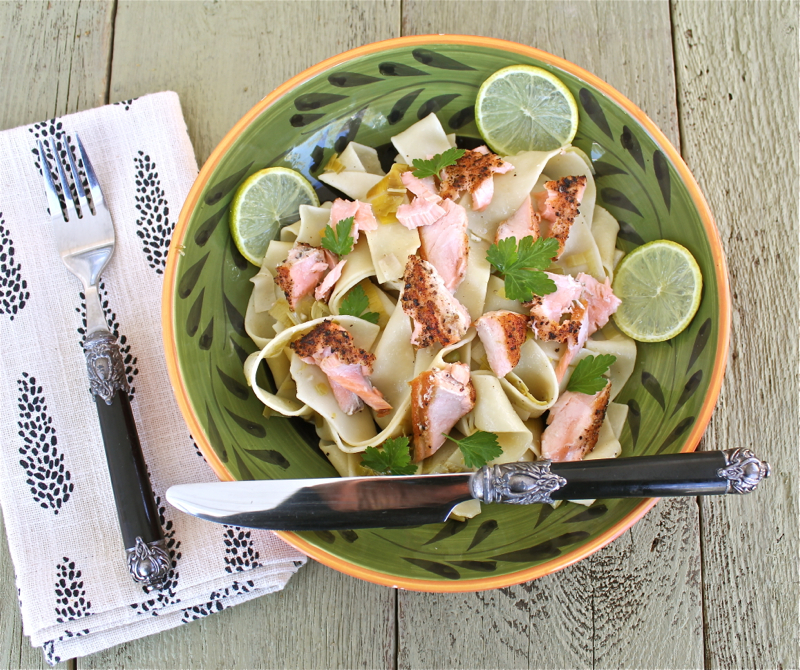 Flake the salmon into large chunks. 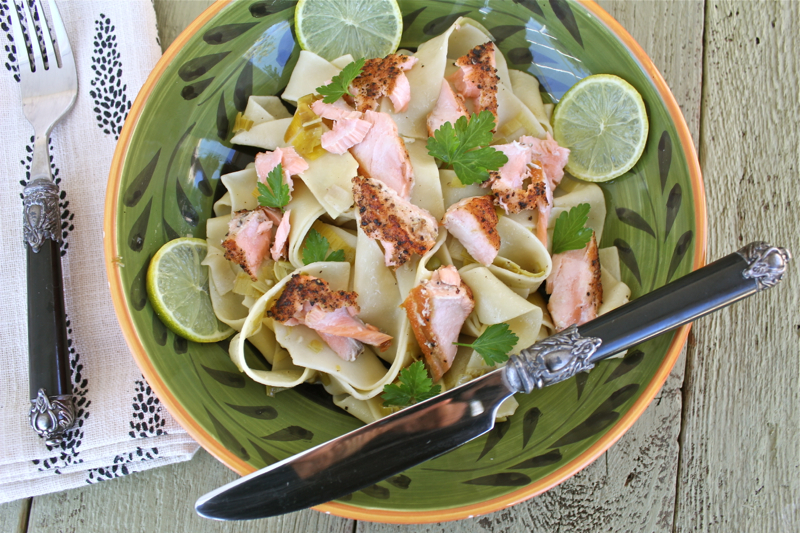 Arrange 1 cup of the pasta mixture on each of 6 plates, and top evenly with flaked salmon. Serve immediately. Posted on February 18, 2015 at 11:33 am. If you have leftover ham from the holidays, this is a perfect way to use it. 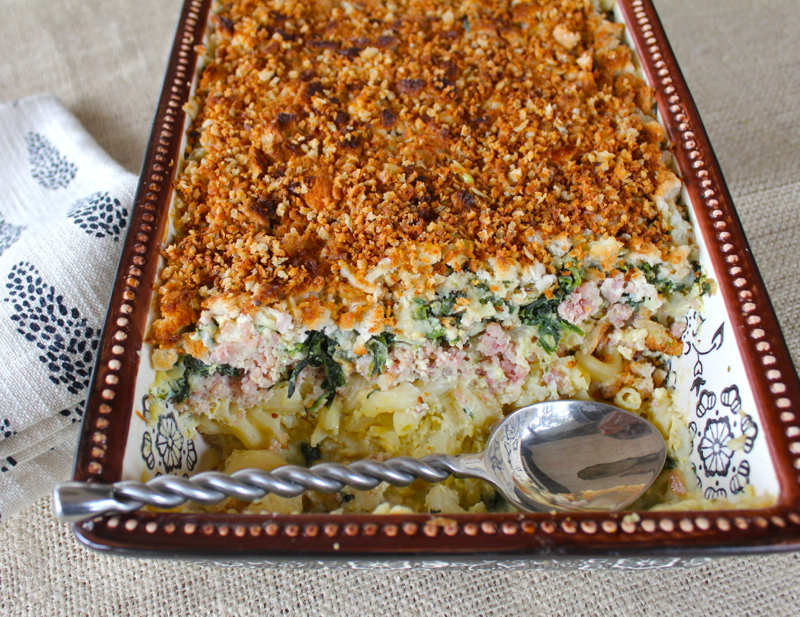 This lovely layered dish gives “casserole” a good name. 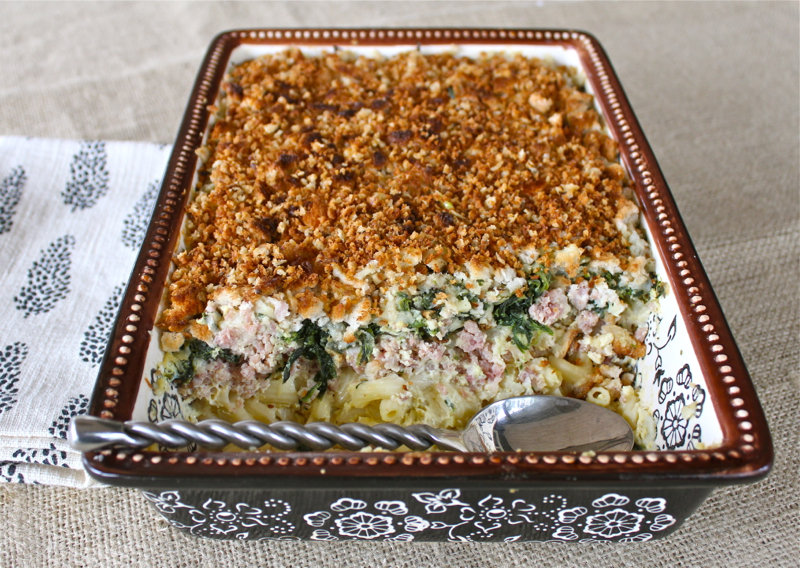 Pasta, Gruyere cheese, minced ham and chopped spinach are bound together in an eggy custard and topped with rye bread crumbs. I made this on a cold dreary afternoon at the lake. Photographing it was a real problem, so what you see was snapped the next day in the slanting light on our porch. The good news is that this dish can be reheated and still tastes as good as the first time. 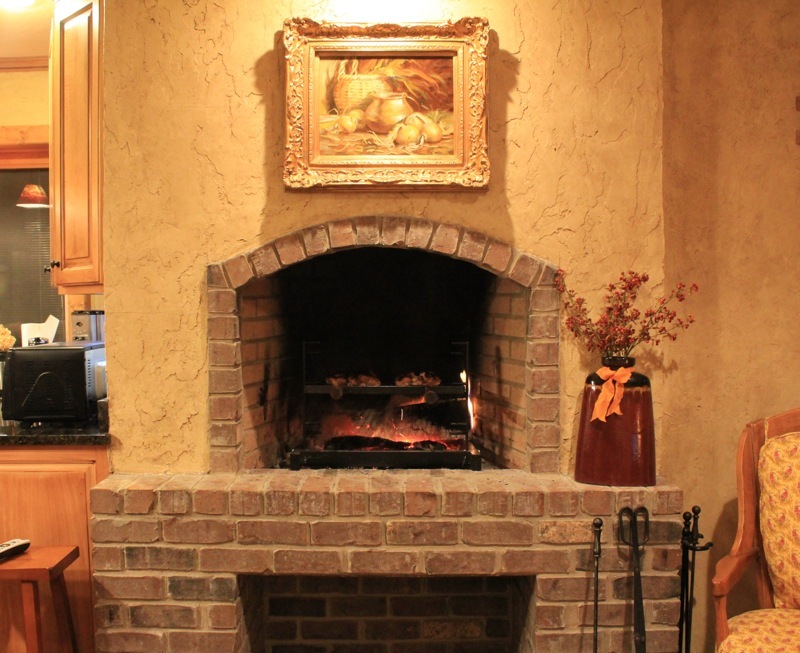 A cold front is headed to Lake Lure and we are looking forward to lighting a fire in the kitchen fireplace and cooking something in the coals. David has a fascination with hearth cookery. We have an adjustable fireplace grill that just fits into our fire box and a cast iron spider pot with legs. The pot sits in the coals and is perfect for cooking stews and roasts. David has accomplished a lot this week. Because the lake level has been lowered, he was able to shore up the sea wall and reinforce the boat house supports. I had a wonderful lunch with my dear blogging friend Penny of The Comforts of Home. We met in Hendersonville, ate brick oven pizza, and shopped on Main Street. It was chilly but sunny. The frigid temperatures remind me of winters in Michigan where I grew up. As nostalgic as it is, I have to say that I am looking forward to returning to Florida soon. 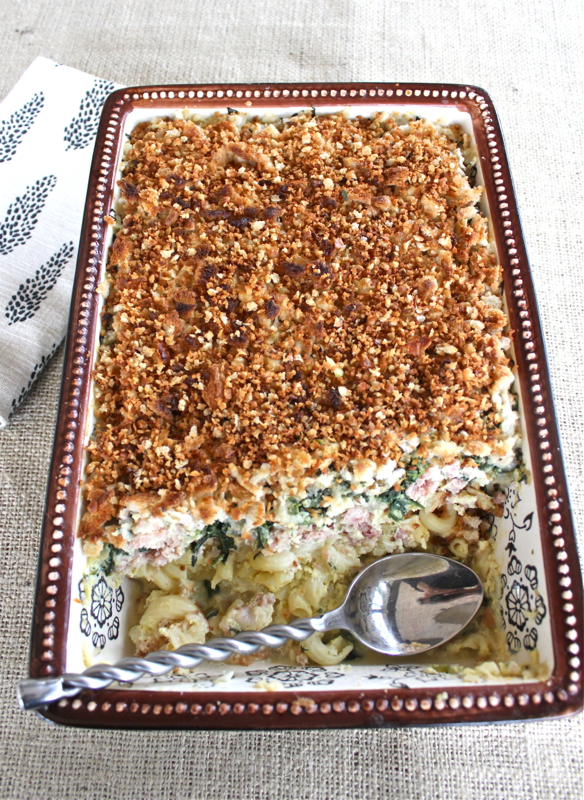 We enjoyed this casserole which I adapted from a recipe in Gourmet Magazine from 1993. Every time I return to the lake, I peruse my collection of magazines dating back to 1968. I wonder if any of them are now collector’s items? The one thing I know for sure is that any recipe from Gourmet is a winner. In a pot of salted boiling water boil the pasta until it is al dente, drain it well, and spread it in a greased 2-quart flameproof shallow baking dish. Sprinkle the pasta with 1/2 cups of the Gruyere, top the Gruyere with the ham, spreading it evenly, and sprinkle the ham with 1 cup of the remaining Gruyere. In a heavy skillet cook the onion and the garlic in the butter over moderately low heat, stirring, until the onion is softened, add the spinach, the nutmeg, and salt and pepper to taste, and cook the mixture over moderate heat, stirring, for 1 to 2 minutes, or until the excess liquid is evaporated. Top the ham layer with the spinach mixture. In a bowl whisk together the eggs, the milk, and salt and pepper to taste, pour the custard slowly over the spinach mixture, and bake the gratin, covered with foil, in the middle of a preheated 400 degree oven for 50 minutes, or until the custard is set. Discard the foil, in a small bowl toss together the remaining 1 cup Gruyere and the bread crumbs, and sprinkle the topping evenly over the custard. Broil the grain under a preheated broiler about 4 inches from the heat for 1 to 2 minutes, or until the cheese is melted and the bread crumbs are golden brown. Serves 6 to 8. Posted on January 8, 2015 at 6:49 am.